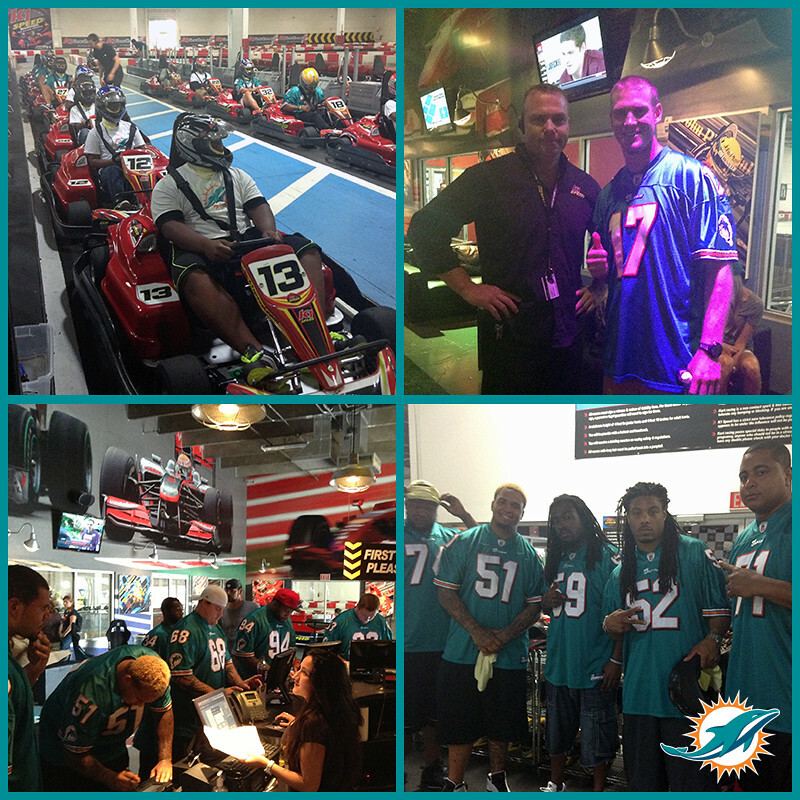 Instead of football helmets, more than 30 Miami Dolphins players donned racing helmets at K1 Speed Fort Lauderdale for an afternoon of go-kart racing with foster teenagers aging out of the program today. All of the kids were chosen to participate by representatives of HANDY, Inc., the organization responsible for placing them in foster homes and providing a nurturing environment for those still waiting. This was a chance for these teenagers to zip around the track with some of their idols and have some fun at the same time. Current Miami Dolphins such as Ryan Tannehill, Matt Moore, Chas Alecxih, Chandler Burden, Dan Carpenter, Nolan Carroll, John Denney, Dannell Ellerbe, Brandon Fields, Nate Garner, Jonas Gray, Brian Hartline, John Jerry, Reshad Jones, Josh Kaddu, Jorvorskie Lane, Lamar Miller and Richard Marshall joined Jonathan Martin, Andrew McDonald, Koa Misi, Moore, Jared Odrick, Julian Posey, Mike Pouncey, Kheeston Randall, Josh Samuda, Derrick Shelby, Austin Spitler, Randy Starks, Tannehill, Marcus Thigpen, Olivier Vernon, Cameron Wake and Philip Wheeler on the track. They all were thrilled to be there for the cause. Click here to read more. HANDY’s mission is to embrace, educate, and empower vulnerable youth to become engaged, productive adults. HANDY annually serves more than 1,300 at-risk children and youth, between the ages of birth to 23 years. HANDY’s programs focus on education, youth development, and economic self-sufficiency.